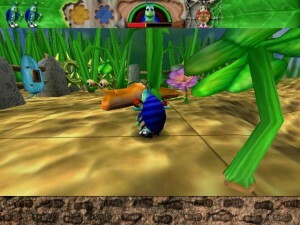 Bugdom, a 3D save-the-princess piece involving anthropomorphized insects, is a game I associate strongly with computer stores. Apparently it was included with certain models of iMac around the year 2000; as a result, it was frequently what I’d see on those candy-coated monitors in CompUSA as I passed by them on the way to the remaindered PC games. Eventually the game showed up among the remaindered PC games itself, although I don’t remember ever seeing it among the new PC games. Perhaps there was a stigma associated with being initially released on the Mac? Everyone knew that the PC was the computer system for games, after all, and that means that anything originating on a Mac must be, at best, a pseudo-game. Or perhaps it was just the limited virtues of the game itself. There’s a clumsiness to the animation that reminds me of Rocko’s Quest, particularly when it comes to the protagonist’s attacks, which consist of kicking his stumpy little bug legs to greater than expected effect. I think it’s a better game on the whole than its surface goofiness suggests, but I do remember getting severely stuck about four levels in (out of 10) when I was trying it the first time. We’ll see if I fare any better today. Aside from its ubiquity on iMacs, the one other major thing of note about it is the mouse controls. As long as you don’t mind never using some of the optional power-ups, you can play this game entirely from the mouse, a factor that probably helped its status as a demo piece: those iMac displays didn’t necessarily risk letting the customers touch a keyboard. But it doesn’t use one mouse button as the go-forward key, like Doom, or map cursor position to speed, like System Shock. Instead, mouse movement maps directly to avatar movement. If you want to use the mouse to move forward in a straight line, you’ll have to keep on picking up the mouse and moving it to the bottom of your mouse pad — or, if you’re using a trackball like me, repeatedly scrunch your fingers back. Now, before you’re too horrified, I should point out that there is a regular go-forward button on the keyboard, and playing the game at any length involves mostly using that. But strangely enough, I sometimes catch myself using just the mouse when I’m distracted. 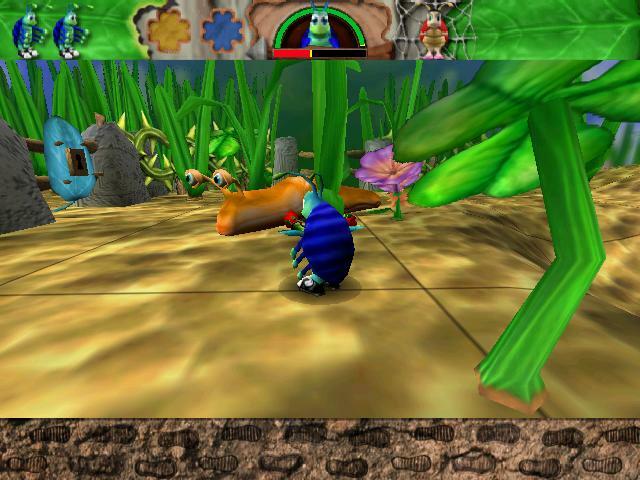 The rhythm of the move-scrunch-move-scrunch fits the relentless oom-pah of the background music on the first two levels, which in turn is suggestive of the busy trundling typical of beetles. Which is about all about the game that suggests insect locomotion, given that most of the bugs here walk on two legs. Today, another random pick from my catalog of titles I own on CD-ROM. Demoniak is one of the few commercially-published text adventures I own but haven’t completed. Created by comics writer Alan Grant in 1991, it’s a sci-fi/superhero story mostly remembered for the novelty that it let the player switch control at any time to any character — even antagonists. I obtained it some years after its original release, when Memorex of all companies re-released it in a 2-pack CD-ROM bundle with Darkseed, a graphic adventure based on the paintings of H. R. Giger. This was clearly a hasty bit of shovelware, because it failed to account for Demoniak’s copy protection. It uses a key word system: at some randomized point within the first dozen or so turns, it prompts the player to type in the Xth word from line Y of page Z of the manual, and refuses to proceed until you get it right. Memorex provided the entire contents of the manual as a text file, but since it’s not paginated, this is of limited use. (Plus, the game occasionally asks for a word from something other than the manual, such as the box or the diskettes.) I suspect that few people noticed this problem. The people responsible for the package presumably tried at most a command or two to make sure that it was working, and probably most of the customers quit the moment they realized that it was a text adventure, something that the packaging tried to obscure. I already knew all this when I pulled it from my box of games abandoned for technical reasons, but I was hoping that the internet would help me. I mean, it’s 2012. Someone, somewhere, had to have either cracked this game or posted a list of the key words somewhere. Alas, the internet failed me. Even when I found Demoniak on abandonware sites, it was uncracked, and accompanied by less documentation than Memorex provided. There was a time when my usual response to key word copy protection would be to hack it out. Generally speaking, it’s the easiest kind of copy protection to hack: somewhere in the code, there’s got to be a point where it compares your input to a target string and conditionally branches to success or failure, so once you’ve identified that point (by tracing through the execution with an assembly-language debugger), all you have to do is replace the conditional branch with an unconditional one (or a no-op, as appropriate). But a game whose chief mode of interaction is text is likely to process its key word input by the same means as all other input in the game, and messing with the parser seems risky, even if the game isn’t programmed in its own proprietary byte code format like the Infocom games were. Today, I’ve gone as far as to install a debugger anyway, just so I can look at memory where the game has unpacked its strings and try to find something promising. But I’ve had no luck yet. If anyone reading this has access to a Demoniak manual, or any other means of bypassing the copy protection, help would be appreciated. I promise my copy is legitimate. The history of Qix is peculiar. It’s one of the foundational titles from the early days of the arcade, one of the ones that blazed its own trail. It’s elegant in its simplicity, highly recognizable, and has been ported to a variety of systems, as well as included in general classic-arcade-game collections. But it never inspired much imitation — it didn’t even get an official update/remake around the year 2000, like Frogger and Qbert did. Perhaps it’s because it was too simple, too difficult to see how to extend its basic rules (surround territory by drawing a line, enemies that touch either you or the line you’re currently drawing will kill you). The only significant extension of that I saw back in the day was in Gals Panic, which, instead of asking the player to capture a certain percentage of the screen, put a silhouette of a shape 1Specifically, the shape of a woman, and even more specifically, of a scantily-clad Japanese woman. Capturing the territory within the silhouette filled in the details of the picture. The version I saw was strictly PG-13, but racier versions were rumored. on the screen and specifically asked you to capture that. This didn’t make a very great difference to how the game was played — the varying enemy behavior was more significant — but it did introduce one important concept: varying terrain. One of the problems with Qix from a game-designer’s stand point is that, like most games before Donkey Kong, it didn’t have anything distinguishing one level from the next. Fast-forward to today. I somehow managed to obtain, though bundles or package deals, not one but two distinct recent Qix-based games, without realizing what they were until I tried them. (Furthermore, I coincidentally tried them both within a span of two days.) There’s one thing that both of these games add to the formula: walls. That is, obstacles that block your passage, but which can’t be used to terminate a line the way that the edge of the uncaptured area can. The best thing to do with a wall is to capture it so it doesn’t present an obstacle any more. They also both add randomly-appearing powerups, and eliminate Qix‘s notion of the “spiral death trap” by allowing the player to retract a line in progress. But other than those commonalities, they take the format in very different directions — more different than I’d have thought it afforded. 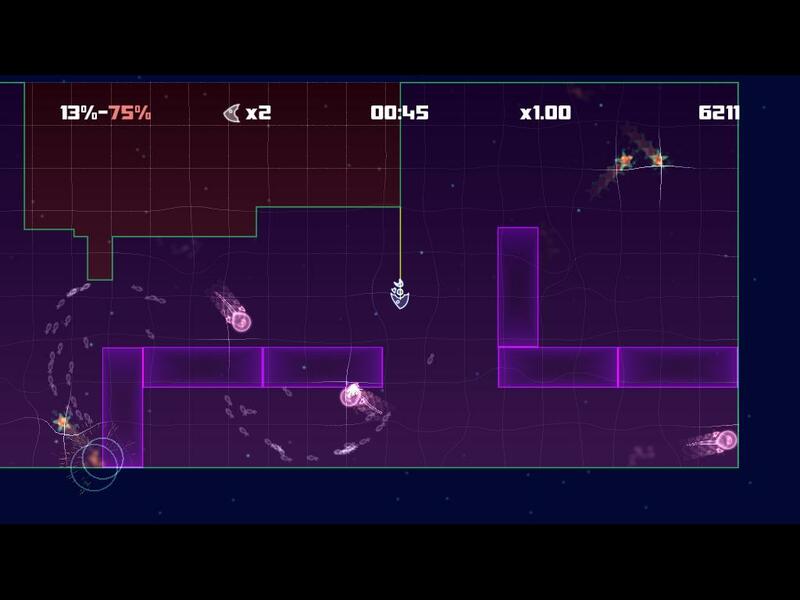 Lightfish, themed around glowing outline-drawings of sea life, keeps it all pretty abstract and simple, and makes everything very light and fast-moving: on some levels, bisecting the board within the first fifteen seconds is a reasonable goal. The challenge comes mainly from the multitude of fast-moving enemies. It’s Qix as Robotron, essentially. You can kill enemies by capturing the territory enclosing them, but they respawn after a time, so finishing a level quickly is important. 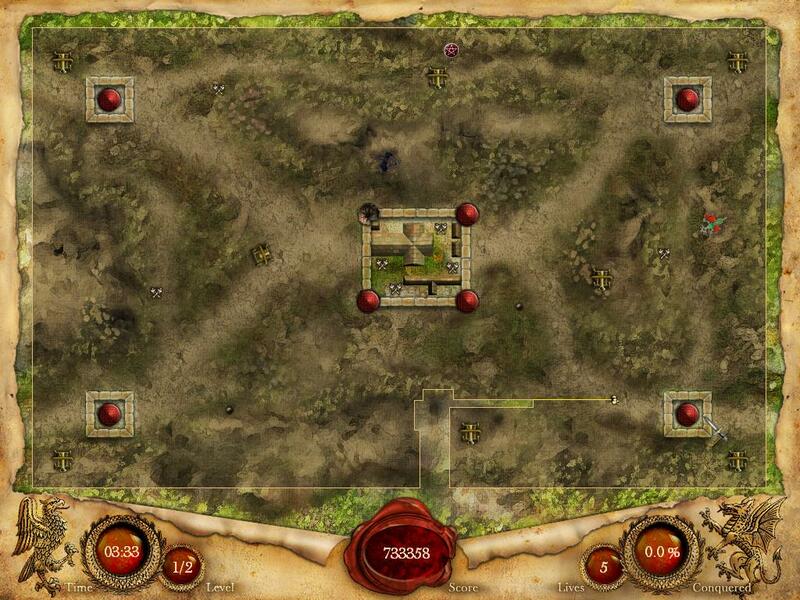 Fortix, themed around capturing forts in a fantasy kingdom, is slower-paced and more tactical. While there are free-roaming dragons on most levels, the chief enemy is stationary towers that lob cannonballs or other projectiles at you. These can be destroyed by capturing a trigger point for one of the level’s single-use catapults, or, if you think you can risk it, by capturing the tower itself — something most easily done by feinting to make them waste a shot and then making a tight loop around them while they reload. 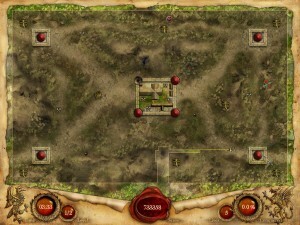 Anything, be it tower or dragon, that you catch in a capture is permanently dead, so unless you’re going for a time bonus, there’s no pressure to be reckless — and, in fact, finishing a level without losing a life is rewarded with a shiny crown on the level select screen (presented as a map of the territories you’re conquering). Fortix adopts the Gals Panic approach of making only a portion of the screen important for completing the level — specifically, the enemy forts, which are generally where the towers are located. This means that, unlike in Lightfish and the original Qix, it’s possible to capture 100% of the important part, satisfying your perfectionist urges. Not only that, it introduces even greater terrain variation by means of visible features, such as rivers and cliff faces, that slow you down to various degrees, changing the effective routes. In particular, crossing a fort wall is extremely slow, making it virtually necessary to use the catapults before moving in on the tower — except that you can’t control which tower a catapult targets, so perhaps you want to capture an outlying tower or two first so that the easier-to-reach catapults will take out the more difficult inner towers. 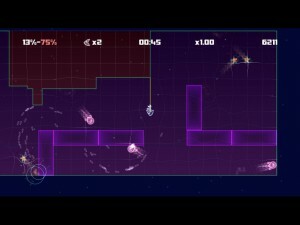 Lightfish, meanwhile, although it does have slow-down terrain in the form of ice blocks, introduces it very late in the game, and mostly treats it as a slightly more forgiving form of wall rather than as a strategic choice: given all the enemies zooming about, unaffected by the ice, you want to avoid it as much as possible. In fact, before it brings out the ice, the one other terrain variation it provides is lava squares, which are identical to walls as far as player choice goes. They’re just walls that give you an opportunity to mess up and die, and that’s not interesting. But it does support the idea that this is more of an action game than Fortix. Where Fortix is more about formulating an effective plan of attack, Lightfish is about not messing up. Lightfish does start becoming more tactical in its later levels, when it starts making walls spiral around in inconvenient ways, but Fortix does a lot more with the concept, including things involving keys that you can capture to open like-colored gates. Between that and the catapults, it has one fundamental concept that Lightfish lacks: that of capturing one point on the map to create effects at a different point. And that seems to be a pretty big deal for creating a satisfying level of depth. 1. ↑ Specifically, the shape of a woman, and even more specifically, of a scantily-clad Japanese woman. Capturing the territory within the silhouette filled in the details of the picture. The version I saw was strictly PG-13, but racier versions were rumored. 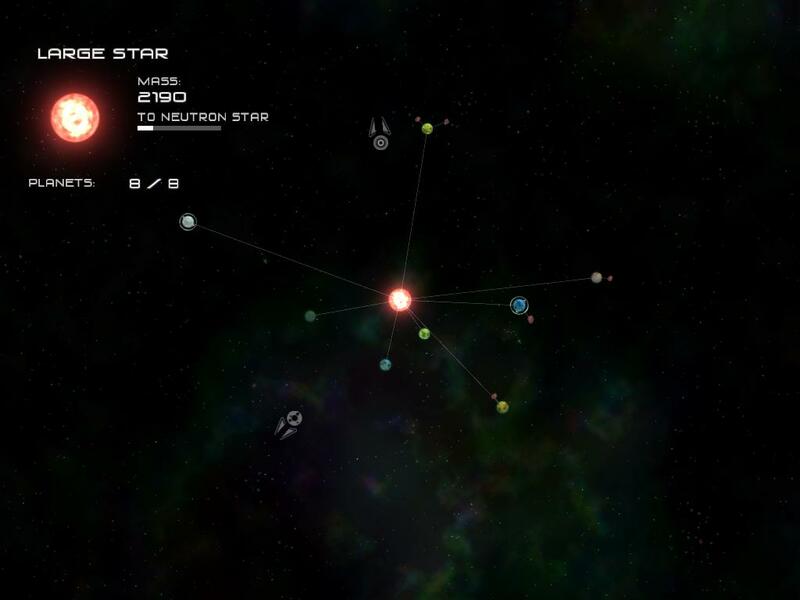 Solar 2 is a 2D game that puts you in the role of a heavenly body — first an asteroid, later a planet or star. As the game’s blurb puts it: “In most games you see stars in the background, you shoot asteroids or you live on planets. But in Solar 2 you ARE these objects!” — which is a little disingenuous, because in fact you see stars in the background here as well; it uses a static starfield-with-nebulas image to provide a sense of motion when you go zooming around the vast depths of space. Which is something you can do. Unlike all the other stars and asteroids and so forth you encounter, you scoff at Newton’s laws and roam about under your own power, like the little spaceships sometimes found near life-bearing planets, blasting apart asteroids that get too close. The way that the spaceships go about their own asteroid-demolition and largely ignore you combines with the free roaming in a very large 2D environment to make it feel at times like a much more relaxed version of Sinistar. The way you grow by accretion, first by ramming into asteroids and later by pulling in planetoids that have gone into orbit around you, is a little Katamari-ish, particularly if you decide to take it to its limit and become a universe-devouring black hole. But, oddly enough, the game that it reminded me of the most is the original Grand Theft Auto. And that’s because of the missions. Missions are assigned by a godlike disembodied voice (presented in text boxes, not voice acting), which sometimes interrupts partway through a mission to assign new goals, or even just to make snarky comments. A typical mission might involve destroying a particular planet, or drawing another planet to a particular location by tugging it with your gravity, or surviving waves of attacking spaceships, or dodging as the godlike voice throws a bunch of stars at you at high speed. When there’s a particular place you need to go, the familiar GTA-style quest arrow points the way. The voice’s narration provides silly pretexts for them all: the asteroid you’re trying to make bigger is an old friend, the planet that you have to decide whether to destroy or defend is populated entirely by kittens, etc. There’s a touch of GLaDOS in its fantasies. There are three sets of missions: one set for when you’re an asteroid, another for when you’re a planet, and a third for when you’re a star. (I wasted some time after I first turned into a planet by restarting to see the Asteroid missions I hadn’t seen yet. This is unnecessary; although there’s no in-game way to go back to earlier stages, you can do so through the main menu without losing your progress.) You actually go through more stages than these three — a neutron star, for example, or a life-bearing planet with your own fleet of defensive spaceships — but these sub-forms do not get distinct missions. Black holes get just one mission, assigned automatically, but all other stages get a choice of several. How do you indicate your choice? More quest arrows! Whenever you’re not engaged in a mission, some arbitrary circles of space are assigned to be mission start points, with an arrow pointing to each. And I really do mean “arbitrary”. There’s no permanent terrain in this game, so there’s no particular mission-receiving place. The mission start points are just arranged around wherever you are, and have no particular relationship to the missions. Frequently the first stage in a mission is just to go someplace else. But you have to go to the mission start to be told where. There’s no real in-game logic for this means of assigning and choosing missions. There are, however, two points of convenience: it requires no additional mechanics beyond what’s already been established for directing the player to locations, and it’s basically familiar to a large portion of the audience from its similarity to GTA. Instead of arbitrary circles placed dynamically in space, GTA used statically-placed pay phones, but the principle was the same. Whenever you weren’t in a mission, you got a quest arrow for each phone that had a mission for you. Choosing your mission by choosing which phone to pick up didn’t really make much more sense there than in Solar 2, but by grounding it in something concrete, it masked the arbitrariness a little better. Solar 2, using the same mechanic, makes it obvious how illogical it always was. It’s been about a month and a half since my last post. I should say a little something to let anyone who still has this in their RSS feed that I’m still around, and intend to start posting again posthaste. I fully intended to to start posting in February, but February was dominated by a major crunch at work, which wound up stretching into March. But that’s basically over now, and I’m even taking a couple of weeks off from work to recover. So the only thing keeping me from posting now is that I’ve fallen out of the habit somewhat. At any rate, I played a bunch of games. Most of my gaming time in January was spent on trying out things that I had purchased but not tried, mostly from various bundles and Steam sales. I didn’t finish many; in most cases, I didn’t seriously try. I just wanted to get a better sense of where games are today — and my main conclusion is that we seem to be in the golden age of tower defense. But I also discovered that I own two distinct Qix clones, and I’ll have a thing or two to say about that. I played a chapter or two of Assassin’s Creed, but ultimately decided not to commit to it until I was writing again, because there’s a great deal to say about it — the narrative structure alone is worth a post. I got a great deal farther in Lego Batman, which I have relatively little to say about that I didn’t already say about Lego Star Wars, but I suppose is still worth a post or two. And I played a whole lot of Terraria. Even during the crunch, I got some good iOS gaming time in on the bus to work, starting with Infinity Blade and the recommendations Gregory Weir made in response to my post on Angry Birds. I’ve finished most of them already; I’m finding that non-“casual” games for iOS tend to skew short, unless they’re ports from other systems. And yes, I have tried a couple of console-to-iOS ports; I’ve had my first real taste of Phoenix Wright this way, as well as gotten started on Final Fantasy III. FF3 used to be in a sort of deadlock state for me. For a while, the only platform it existed on in the US officially was the Nintendo DS. I had plans to get a DS as soon as I had finished all my GBA games, which I’ve very nearly done: the only one left is Kingdom Hearts: Chain of Memories. But I remember thinking when I played the original Kingdom Hearts that I really wanted to play the rest of the Final Fantasy games before playing any more in that franchise, so I’d understand all the references. Well, the rise of phones and tablets as gaming platforms has cut that loop, and also made my eventual DS purchase far less likely. The one thing I didn’t do was look at my older titles. This is because I somehow felt that I shouldn’t be playing them unless I’m also writing about them. So the blog continues to be counterproductive for shrinking the Stack even when I’m not writing it! I will say this, though: I’ve come to the conclusion that I should be considering the titles I own on physical media separately from the ones I only have through Steam or whatever, and possibly only consider the former as Stack material. This would give me a goal that I could possibly finish in my lifetime. I’ll still blog about other games, of course. In my previous post, I promised to say something about Solar 2, and I intend to make good on that tomorrow.